For years Lama Zopa Rinpoche has envisioned a practical book to inform students of how to help loved ones have a beneficial death. How to Enjoy Death has been compiled from years of Rinpoche's teachings and has been lovingly edited by Venerable Robina Courtin. 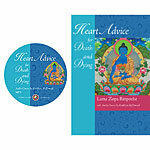 Here Lama Zopa Rinpoche provides detailed advice on how best to prepare ourselves to face the inevitable end of our own and our loved one's lives with courage, grace, and a mind free of fear. With great care, Rinpoche explains what to do in the months, weeks, and days that precede death, as well as how to handle the moment itself and the mantras, prayers, and meditations that must follow the death of a loved one. All of the practices one needs to be prepared to face death are handily included between the covers of this thoroughly pragmatic volume, making this an essential reference for Tibetan Buddhist practitioners, caregivers, hospice workers, or chaplains. Hardcover, 2016 edition, 464 pages. For years Lama Zopa Rinpoche has envisioned a practical book to inform students of how to help loved ones have a beneficial death. 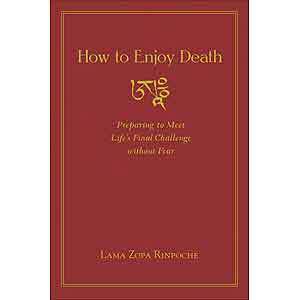 How to Enjoy Death has been compiled from years of Rinpocheâ€™s teachings and has been lovingly edited by Venerable Robina Courtin. Here Lama Zopa Rinpoche provides detailed advice on how best to prepare ourselves to face the inevitable end of our own and our loved oneâ€™s lives with courage, grace, and a mind free of fear. With great care, Rinpoche explains what to do in the months, weeks, and days that precede death, as well as how to handle the moment itself and the mantras, prayers, and meditations that must follow the death of a loved one. All of the practices one needs to be prepared to face death are handily included between the covers of this thoroughly pragmatic volume, making this an essential reference for Tibetan Buddhist practitioners, caregivers, hospice workers, or chaplains.